Santorini Restrictions – a straw in the wind? 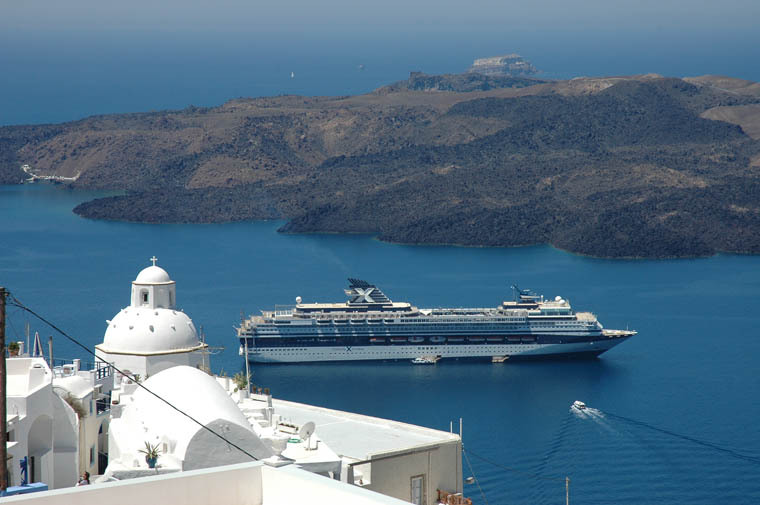 It’s been widely reported that the port authority at Santorini is to limit the number of cruise passengers per day, to a maximum of 8,000. There aren’t many days when this figure is exceeded, theoretically – looking at CruiseTT for Santorini for this summer there are only nine days when the ‘Port Load’ reaches or exceeds 8,000 passengers. However I think there may be some issues with CruiseTT’s figures – looking closely I notice that Royal Princess seems to have a default passenger total of 688 whereas in fact Royal Princess’ capacity is from 3,600 up to a maximum of 4,380. There might be other ships for which CruiseTT has an incorrect capacity, or indeed they may be missing ships altogether. Either way, let’s say that there would be a number of days during the summer when more than 8k passengers are scheduled to arrive. The reason for the problem, of course, is two-fold: first, the increasing number of ships calling there, and secondly the size of those ships. I don’t really see a way out of this impasse – the lines will continue to build ever bigger ships (very few of the two dozen new ships to be delivered in the next few years could be called anything other than huge), and Santorini will continue to be a favourite destination. Increasingly so, perhaps – the lines seem to be drawing back from ports in Turkey and Egypt so the Aegean islands will get the additional calls. Perhaps action such as that taken by Santorini is the only thing that can be done. It’s also not clear when this restriction will come into force; the 2016 schedules are already in use, and 2017 schedules have presumably been agreed with the ports. I wonder is any other ports will follow suit, and if so, how many? Santorini is not the first to do this – we have already seen restrictions put into place at Venice. The ostensible reason was to reduce possible erosion of the canal sides allegedly caused by the passage of the megaships, and the action taken was to ban the largest ships from traversing St Mark’s Basin and the Giudecca Canal, but given that that’s the only way to the cruise terminal, that’s effectively a ban on those large ships. Again, I wouldn’t want to argue against this action – no-one wants to see Venice any more damaged than it already is. So where could be next? Anywhere with a small port and/or residential population, I would think, and places such as Mykonos or Dubrovnik spring to mind. Are we at ‘Peak Cruise’ in the Mediterranean, I wonder? Perhaps the future of cruising in the Med will only include ports associated with busy cities and having capacious infrastructure – Barcelona, Civitavecchia, Naples and Marseilles spring to mind. In the eastern Mediterranean, perhaps only Piraeus/Athens and Istanbul will be available. One upshot of that is that the cruise will become a thing in and of itself – the ship will take an ever-more important role, and passengers will spend more and more time on board and less and less time going ashore. That will make the cruise lines happy of course: passengers on board = increased revenue. So who knows if we’ll ever get back to Santorini? Better leave you with a few images from one of our earlier visits….